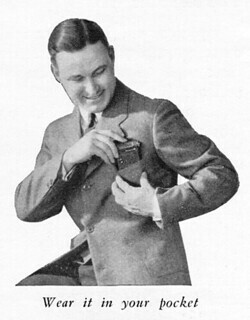 The Vest Pocket Kodak cameras were a best-selling folding camera series made by Eastman Kodak (Rochester), from 1912 to 1935. They were the first cameras to use the smaller 127 film reels. "Hawk-Eye" versions of the Vest Pocket Kodaks were premium models, and the "Special" models had more sophisticated lens/shutter combinations. 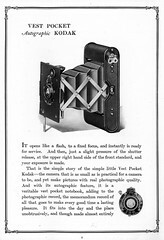 A special Vest Pocket wooden development tank for the typIe 127 rollfilm was available from Kodak, as well as a special Vest Pocket enlarging camera. This is the original model and doesn't have the Autographic feature which was added to create the later models. It had to be loaded through the top, inserting both film spools at once with the film stretched between them. 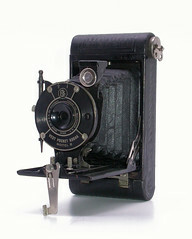 It had the small three-blade variant of Kodak's Ball Bearing Shutter No.0. Folded it was really handsome, not bigger than many modern compact cameras. Hidden behind its lens board was its brilliant finder. A strut folding variant had a f/6.8 72mm achromatic meniscus lens, hidden behind a mask that allowed a maximum aperture of f/11. The British version exclusively got a true f/6.8 lens from Italian optics maker Koristka. 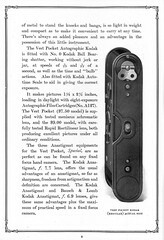 The Vest Pocket Autographic Kodak was the version advertised in the U.S.A. as the "Soldier's camera" during World War I. It was very successful, selling 1,750,000 units. It was of the compact strut folding type and had the meniscus lens or a U.S.-speed 8 Rapid Rectilinear lens. 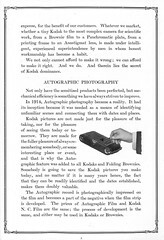 The camera back had an area through which notes could be written onto the paper backing of the 127 film, the "autographic" feature - invented by Henry J. Gaisman. 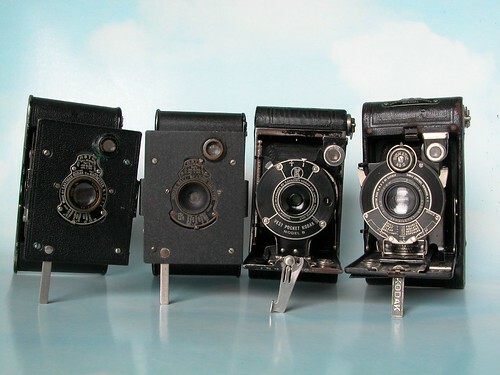 These models were equipped with selected f/6.9 and f/7.7 lenses by Kodak, Bausch & Lomb, Zeiss, Ross, Berthiot or Cooke, mainly with the Kodak Anastigmat f/7.7 lens. The most sought-after is the focusing Zeiss Tessar f/4.9 version with a 8 speed Compur shutter. 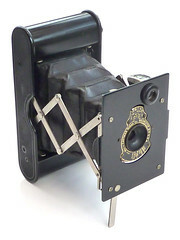 This was a quite different camera; a primitive folding bed camera for making 4×6.5cm exposures on 127 film. 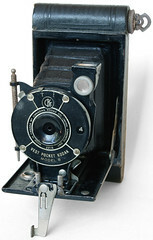 It was also marketed as Boy Scout Kodak and Girl Scout Kodak with new front plate designs by Walter Dorwin Teague. 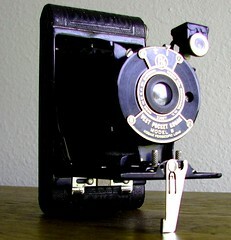 A colored version was branded Kodak Petite. Its lens was a doublet in a rotary shutter, or a Kodak Periscopic lens in a Kodak shutter. The lens typically had four apertures, set by a thumb-wheel on the side of the shutter block, and numbered 1-4. The Model B had to be loaded through the front side, after removing the whole bed and bellows unit. It was produced from 1925 to 1934 and cost $7.50. It had the "autographic" feature. 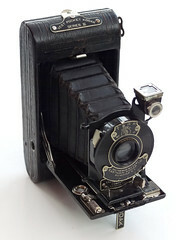 This model appears to be styled like and work similar to a Model B but has Kodex or Diomatic shutter with more speeds, an aperture selector in f-stops and a screw thread focusing system. This model was also the basis for the coloured art deco Kodak Petite, Vanity Kodak and Coquette versions designed by Walter Dorwin Teague. 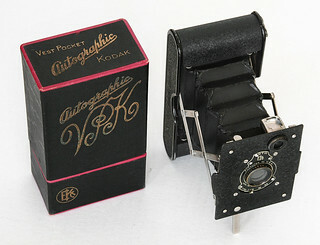 This model is the replacement for the previous VPK Autographic Special models using the bed style of the Model B but has better shutters and faster lenses. Two climbers, George Mallory and Andrew Irvine, lost on Everest in 1924, may have been the first to reach the summit. Another member of the expedition has been quoted as saying that he had loaned his Kodak VPK camera to Mallory as they passed each other on the north ridge. There are and extensive efforts underway using current technology to locate Irvine's body and perhaps, the camera. 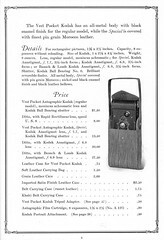 Vest Pocket Kodak, Model B, Series III, and Kodak manuals on Mischa Koning's site. Vest Pocket Manual and Model B manual at Michael Butkus' Orphan cameras. 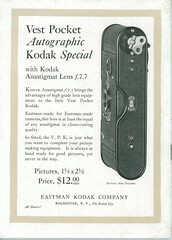 Vest Pocket Kodak Autographic at Classic Cameras by RaúlM.